Free Shipping Included! Family 4 players 4 color Murble large family set. by Murble Game at Scruffs Game. MPN: Murble Game - 9B. Hurry! Limited time offer. Offer valid only while supplies last. Murbles are an American made outdoor family game that can be enjoyed by 3 generations. Murbles are easy to play, easy to see and easy to score. Murbles are an American made outdoor family game that can be enjoyed by 3 generations. Murbles are easy to play, easy to see and easy to score. Simply toss the point ball into play, then alternate turns trying to get your game balls as close as you can to the point ball. The player with one or more Murbles closest to the point ball wins points. It is just that easy! There is no court required, nothing to set up just dump the balls out from the Murble bag and you're in the game. to make the game more changeling, use the obstacles in the terrain to your advantage. The Family 9 ball set has a weight of around 6 pounds, light enough to take to the beach, Park, camping, tailgating or just out in the backyard. All of the Murbles are the same size, 3 inches in diameter with an unit weight of 1/2 pound each. The balls are made withn a high density poly plastic that is dourable, has good ball action and is also buoyant, in case one gets tossed into the water. The Family Murble set is designed so four players with 2 balls each so they can play at the same time. The Murbles are sized right so smaller hands and older shoulders can both enjoy playing the game. Murbles are made for players from 8 years old up. Murbles come in an array of school colors and comes with a matching heavy duty canvas drawstring bag with the game rules permanently printed on the back of the bag. Murbles are made to last a lifetime and will provide a lifetime of fun for your family and friends. Get you set today!!! Murbles are proudly american made utilizing some recycled product. Murbles is a fun exciting game for the whole family. Murbles can be played almost anywhere and requires no skills to play. Anyone can play murbles, rules are on the back of the bag, just dump and play. 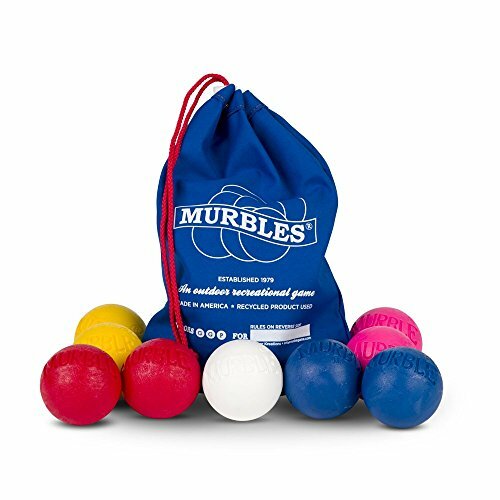 Murbles are very durable solid plastic balls made to last a life time. If you have any questions about this product by Murble Game, contact us by completing and submitting the form below. If you are looking for a specif part number, please include it with your message.